The United States officially opening its new embassy in Jerusalem on Monday, fulfilling a key promise made by its president, Donald Trump. Prime Minister Benjamin Netanyahu speaks at the official opening ceremony of the U.S. embassy in Jerusalem on May 14, 2018. Photo by Yonatan Sindel/Flash90. Trump, who did not attend the ceremony, issued a video greeting to the attendees. “Today, Jerusalem is the seat of Israel’s government; it is the home of the Israeli legislature and the Israeli Supreme Court, and Israel’s prime minister and president,” he said. The embassy ceremony, which was attended by some 800 American and Israeli officials, was held in Jerusalem’s Arnona neighborhood, the site of the new embassy. 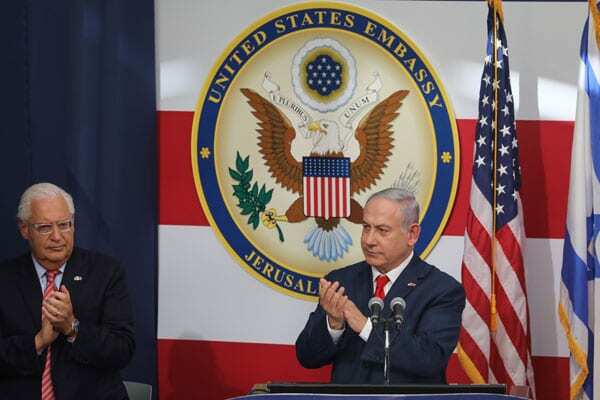 Its opening capped a move first set forth by Congress in 1995 as part of the Jerusalem Embassy Act, which recognized Jerusalem as the capital of Israel and called for the relocation of the embassy from Tel Aviv to Jerusalem. However, successive American presidents, citing national security issues, have issued six-month waivers on the move until Trump announced his decision in December 2017 to go forward with it. The United States has long had a consulate in Jerusalem, which mainly dealt with the Palestinian Authority. The new Jerusalem embassy will see the ambassador’s office and about 50 staff members relocate to an already existing former U.S. consulate in Jerusalem, while the United States plans for eventually building an entirely new embassy building in the city. The Trump administration was well-represented at the embassy dedication, with Deputy Secretary of State John J. Sullivan, Secretary of the Treasury Steven Mnuchin, Trump’s son-in-law and senior adviser Jared Kushner, Trump’s daughter and adviser Ivanka Trump, and Special Representative for International Negotiations Jason Greenblatt all attending. Additionally, U.S. Ambassador to Israel David Friedman presided over the embassy ceremony. “While presidents before him have backed down from their pledge to move the American Embassy once they were in office, this president delivered. Because when President Trump makes a promise, he keeps it,” said Kushner. Israeli Prime Minister Benjamin Netanyahu also thanked the U.S. leader for “having the courage” to move the embassy. The opening of the embassy on Monday also came amid clashes between Israeli security forces and Palestinians along border with Gaza. At least 52 Palestinians had been killed in the violence as nearly 40,000 Palestinians, encouraged by the terror group Hamas, gathered along the security fence where they burned tires, threw stones and attempted to infiltrate Israel.